The 23 distinct residential-scale gardens are attractively contained in a spectacularly engineered eight-acre design. Adults and children visit and learn about vegetable gardening, flower growing, planting ornamental shrubs, landscaping, indoor plants and more. The Kemper Center features an 8,000-square-foot pavilion which contains displays, a reference library, the Plant Doctor clinic, a classroom, indoor gardening displays, a monthly gardening calendar display and much more for the gardening enthusiast. Visit the Kemper Center throughout the year for timely tips and advice on gardening and related subjects. An allée of crabapples lines both sides of the path leading to a fountain of dancing geese. Along the way you will find drifts of spring, summer and fall flowering bulbs planted in a fruit-tree understory with Carex and Pachysandra ground cover. For many people, backyard gardens are extended living spaces. Our Backyard Garden features plants that provide continuous seasonal interest, such as red and yellow twig dogwood, shrub hollies, dwarf crabapples, a successional planting of flowering bulbs, hanging baskets and containers of flowering annuals. Plants attractive to birds are featured, including evergreen screening to provide shelter. Red flower borders attract hummingbirds. Shrub and perennial borders provide nesting and food. The Butterfly Meadow contains water and plants that supply nectar and pollen to attract butterflies to the garden. Butterflies generally enjoy flat landscapes protected from strong winds. They will be most noticeable in the morning and evening and especially in the late summer and fall. A Japanese-inspired viewing structure made of cedar and stucco incorporates butterfly-friendly plantings. One of two gardens designed for children, this smaller garden sparks curiosity and wonder about plants with striking colors, unusual forms, fragrances and textures. At the center of the garden is a shrub-bordered maze, winding around to a peacock fountain in the center. 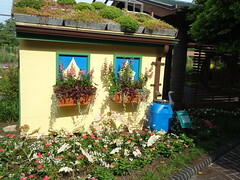 Learn about the Doris I. Schnuck Children's Garden. Gardening can be a challenge for those who have a small space bounded by fences or walls. The City Garden boasts a productive vegetable garden, small flowering and evergreen shrubs, and a selection of shade-tolerant and full-sun vines used to cover and soften vertical walls and create a cozy atmosphere. This garden contains test plots for flowers, vegetables and fruit. While plants will be rigorously tested, horticultural techniques are also displayed and evaluated. The finest fruit and vegetable varieties that can be grown in the St. Louis area are featured in this garden. 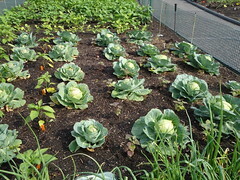 A wide range of information and helpful hints on starting and maintaining a vegetable garden on any scale is available. A cedar pergola forms the backdrop for this display of hundreds of perennials combined to provide year-long color in the home garden. 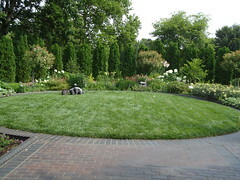 Flanking the Flower Border is a lawn area planted in true dwarf fescue, a low-maintenance turfgrass. Every year, hundreds of new annual and perennial varieties are grown and evaluated for their durability, aesthetic appeal and suitability for the gardening public. 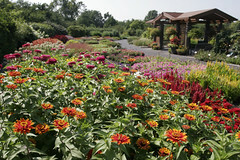 The Flower Trial Garden displays the newest varieties for gardeners to trial at home. 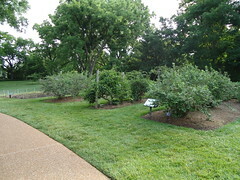 Some of the best fragrance plants for the St. Louis area are on display, including examples of shrub and antique roses. This is a special garden that delights the senses with its beauty and the sound of splashing water. In the Fruit Garden you will find a diverse selection of apple trees, including those for fresh eating as well as baking. Other favorites planted here are grapes, gooseberries, strawberries, blackberries and currants. Plants are easily accessible to all, including persons requiring walking aids and wheelchairs. Interesting and innovative ideas for the most diverse and enjoyable gardening experiences include raised beds and planters of varying heights and sizes; benches; and a tool display of digging attachments, handle extensions and modified pruners. The Zimmerman Sensory Garden is also designed to engage people with disabilities. Ground cover plants are low-maintenance plants that spread out to cover the ground surface completely. In the Ground Cover Border, you will find a selection of moderate to vigorous spreaders ranging in height from less than six inches to several feet. This garden replicates an eastern Missouri woodland full of shade-loving plants below a canopy of maple and oak trees. Shade gardens can be colorful and interesting, as this garden demonstrates. Notable plants here include azaleas, astilbes, variegated hostas, euonymous, foxgloves and cotoneasters. The overlook provides a panoramic view of the Fragrance Garden and the hundreds of perennials in the Flower Borders. The prairie garden recreates a portion of the native prairie that once existed in Missouri. It is the first in a series of native plant gardens located on a knoll overlooking the Kemper Center pavilion. Limestone and sandstone rock ledges, unique geological features of Missouri, create a special habitat for plants. The Rock Garden displays a combination of native and cultivated plants growing in and around limestone and sandstone boulders. Located in a secluded corner, this intimate oasis is plotted in a semi-circular pattern of herbaceous perennials with a tall evergreen perimeter hedge. The garden centers on a life-size bronze sculpture of a cocker spaniel quizzically examining a porcupine. The Summer Plant House is a shaded outdoor working area equipped with a bench and tools to handle routine gardening tasks like repotting, mixing soils and propagating plants. A mixture of herbaceous perennials, including hardy lilies, ornamental grasses, mounding evergreens, small shade trees and containers of colorful annuals, surround the Terrace Garden's patio. A vine-covered trellis forms the backdrop for this comfortable area.